FIRST CARLSBERG MILLIONAIRE SAILS SMOOTHLY INTO YEAR OF THE SHEEP ! One lucky Malaysian turned millionaire when he emerged the winner of Carlsberg Malaysia’s 2015 Chinese New Year Millionaire contest, on March 17, going home RM1,000,000 richer. 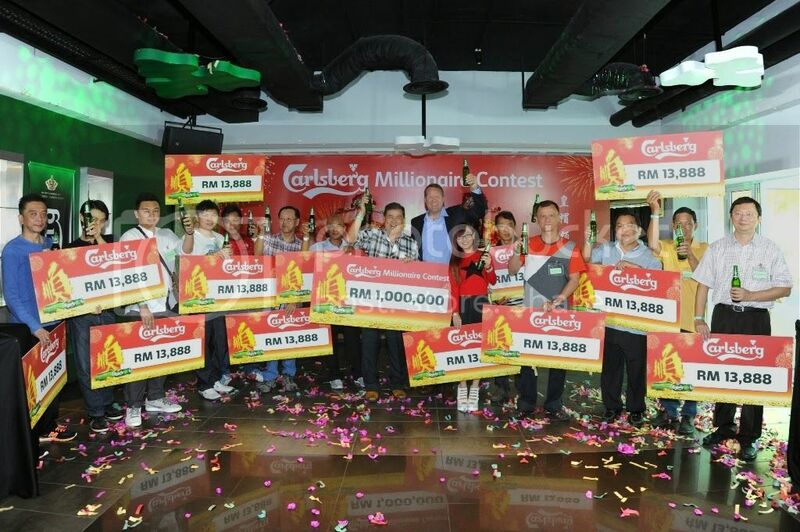 The windfall is Carlsberg Malaysia’s single largest cash sum to be awarded to a sole individual, who had also earlier won a RM13,888 cash prize along with 13 other finalists. Hailing from various parts of the country, all 14 contenders went through a nail biting experience as they vied for the coveted Carlsberg Millionaire title. Each of the contestants had to draw three numbers from an enclosed box, and Lim Chong Boon, who had the highest total sum of numbers and correctly answered a final question to walk away with the million Ringgit! 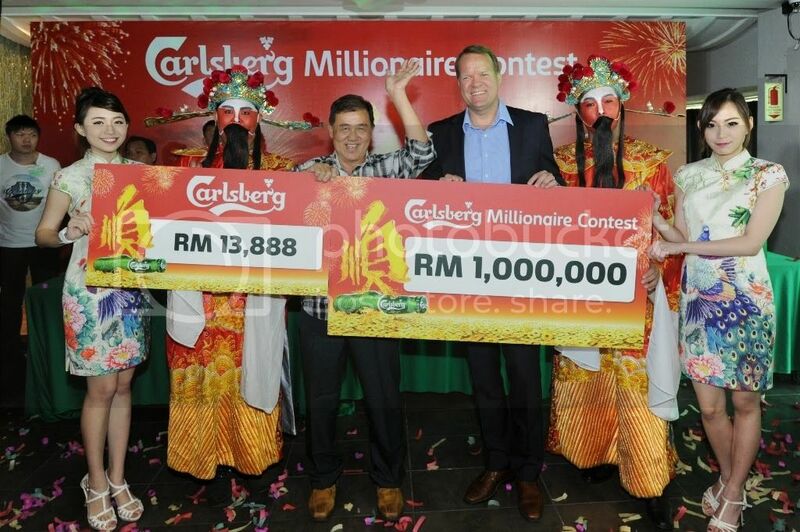 The winners of Carlsberg’s Chinese New Year Promotion had a smooth sailing start to the year having each won cash prizes of RM13,888, including a double windfall for Carlsberg Millionaire, Lim Chong Boon. “I’ve been a loyal supporter of Carlsberg and have been drinking the beer for the past 40 years already. In fact, one of my favourite past times is to have a drink or two with my friends at coffee shops, and it has definitely paid off!” said Chong Boon, 60. 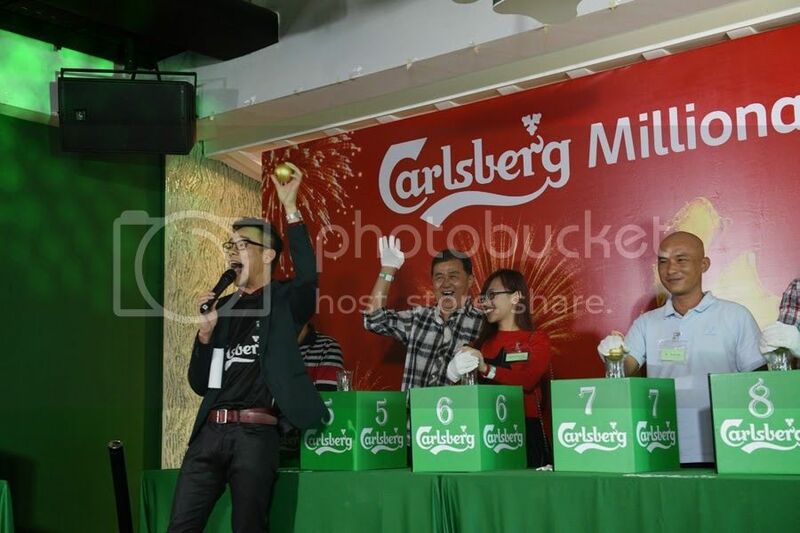 Lim Chong Boon’s final draw ensured that he was in good standing to be the Carlsberg Millionaire; he ended with the combined total of 19 points. In addition, also a winner of the Carlsberg Malaysia’s 2015 Chinese New Year Millionaire contest was Lee Kim Huey, 22, who hails from Kuala Lumpur. “I was out doing my Chinese New Year shopping with my family, when we later discovered the congratulatory message on the tray of our Carlsberg festive pack! While we didn’t win a million Ringgit today, we are very happy with the RM13,888 we won. We are planning to go on a trip at the end of the year,” she said. Carlsberg Millionaire contestants displaying their placement order which was determined through their selection of giant Ang Pau packets. Carlsberg’s 2015 Chinese New Year consumer promotion, which ran for eight weeks, ended at the end of February 2015. During the promotion period, consumers merely had to discover the Chinese character for ‘smooth’ (順) on the underside of bottle caps of any large bottle of Carlsberg, Asahi Super Dry and Royal Stout purchased at participating restaurants, food courts, hawker centres and coffee shops, or purchase a 24-can Carlsberg Festive Pack from participating supermarkets and hypermarkets and check for the congratulatory message printed at the base of the tray, to win the RM13,888 cash prize. Other prizes were also awarded during the campaign. For more information on the Carlsberg Millionaire, visit www.carlsberg-cny.com.my or www.facebook.com/CarlsbergMY.